To find out how to keep your sanity, and your comments under control, keep reading. The first step to getting a handle on your website’s comments is to configure your website properly. Start by navigating to Settings > Discussion. Most importantly, when it comes to properly managing your website’s comments, you should define whether to receive email notifications. For example, you can receive an alert anytime someone posts a comment on your website, or when a comment is being held for moderation. Though the task of manually moderating every comment is time-consuming, this option is still available for those who prefer that method or have a small website where manually managing comments is not too overwhelming. 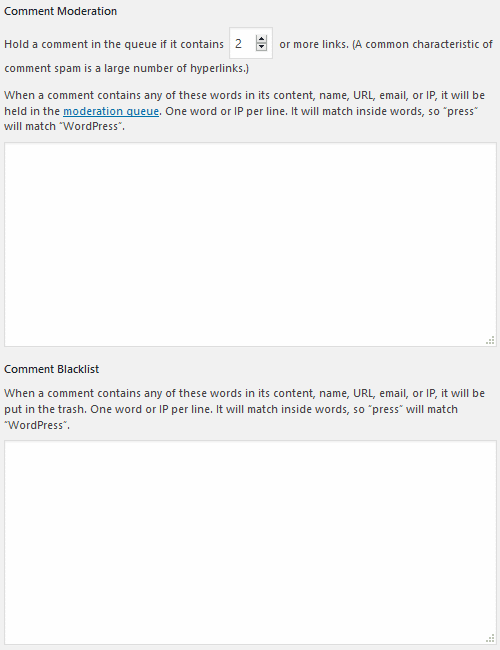 If you do decide to manually moderate comments on your website, there is also another way to lessen the hassle a bit. Again, navigate to Settings > Discussion and scroll down to the section labeled Before a comment appears. 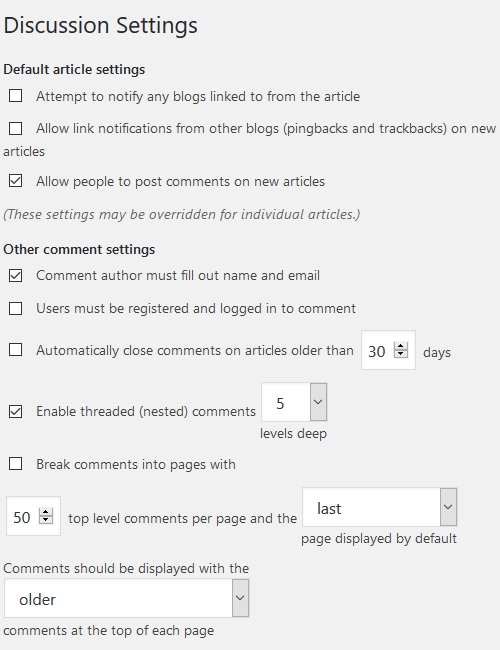 Here you can choose to manually approve all comments left on your website (which is not always recommended). Or, you can select the box allowing any comment left by a previously approved comment author. For websites with a ton of loyal readers that regularly comment on your content, this drastically cuts the moderation process. If you are really looking for an easy way to moderate your website’s comments, try using one of the many WordPress commenting plugins that are available. They typically work to clear your website of suspicious, spammy looking comments, without you having to moderate every single comment left on your website. Instead, they either leave the questionable comments for you to approve, or eliminate them altogether with no further action required on your part. This is a simple way to filter out most comment issues on your website. However, you should double check every now and then to make sure legitimate comments aren’t accidentally being marked as spam. In addition, this plugin supports caching plugins, WPForms, BuddyPress, and Contact Form 7 to name a few. This all-in-one comment moderation plugin eliminates all kinds of spam – comment, contact form, registration, trackback, and pingback. In the end, this plugin helps to clear your WordPress website from thousands of spam comments that can strain your server and affect your page speed, overall site performance, and of course, user experience. Moderating your WordPress website’s comments can be a challenging task if you have a large website, lots of site traffic, and plenty of user enagagement with your content. And, short of disabling the commenting feature on your website, you must take some steps to control your comments to maintain an authoritative stance in your niche. Try moderating your comments using any number of the above-mentioned tips and tricks and see how your website improves in all areas – user engagement, page speed, performance, and popularity. I agree, Akismet is a great plugin for monitoring and controlling spam on your WordPress website. In fact, that’s the plugin I use (and always have used) on my own personal website. My favorite part is that it does most of the work for me, while still allowing me some control over whether to mark a comment as truly spam or not. While this may not work for some huge websites that receive tons of comments daily, for a moderate website such as my own, I think it more than does the job. And, it’s FREE which of course I love! Blocking spam comments can be really difficult at times. Thanks for sharing this info. I will certainly try out some of these methods. I am using Akismet. It’s good.